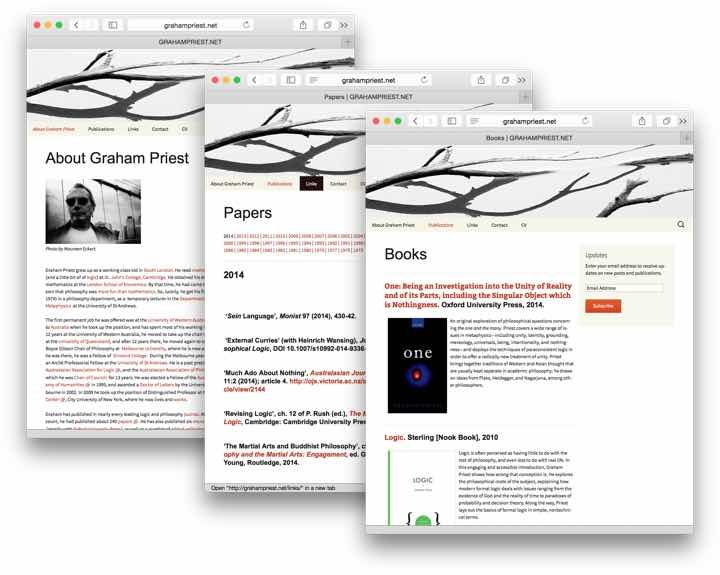 GRAHAMPRIEST.NET is a custom WordPress installation which includes an extensive library of Graham Priest’s papers and articles in the form of downloadable pdf files. The WordPress platform of the site allows the author to control and update the content of the site without having to call on an developer. The about section was authored and customized by Graham Priest himself, making him a WordPress webmaster in his own right. Books and Edited Books sections showcase published books authored or edited by Graham Priest. Links to the publishers have been added to allow for quick purchase or additional information from the publisher websites. At the heart of this website, is a collection of downloadable papers and articles by Graham Priest. The download section presents the most comprehensive collection of Graham Priest’s papers and articles available online. The papers and articles can be downloaded anonymously. No login, no registration is required.